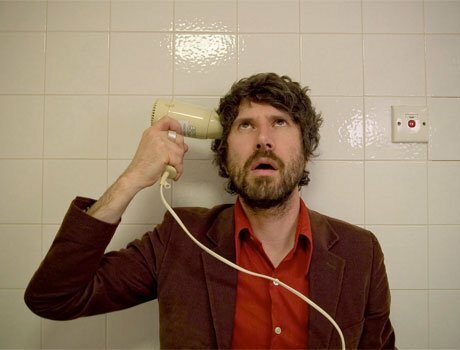 Super Furry Animals weirdo Gruff Rhys has already released his new album Hotel Shampoo in the UK. If you haven't heard it yet, head over to Click Hear and give it a spin. If you like what you hear but don't want to pay those hefty import prices, fret not: the album will now be getting a proper North American release via Wichita Recordings on May 3. On top of that, Rhys will treat our continent to a newly announced tour as well. The month-long jaunt kicks off in Brooklyn on May 18 and runs until June 15. Along the way, Rhys will hit up Vancouver's Biltmore Cabaret on June 4 and Toronto's Horseshoe Tavern on June 11. All dates are available below. Gruff's relentless output doesn't end there, either, as he plans to premiere his film called Separado! at this year's SXSW Film Festival. As previously reported, the film sees Gruff travelling around South America trying to track down his long-lost Patagonian relatives. A trailer can be seen below.